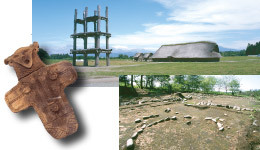 The recent discovery of the Sannai Maruyama Site revolutionized existing theories on Jomon culture. The exhibition center, ‘Jomon Jiyukan’ offers various hands-on experiences, including making Jomon pochettes and mini clay figures. Near by, visitors can also view the Komakino Site, large stone circles from the Jomon period whose mysteries have yet to be uncovered. Located a short walk from Aomori station. Wa rasse offers visitors an authentic Nebuta experience all year round. Along with a boundless view of Mutsu Bay, this hot spring area has a history of nearly 1,200 years, but still offers a moment of luxury even today. The onsen of Asamushi Onsen Ryokan Union provide a place to relax and unwind throughout the year. Hakkoda is a mecca for snow sports. As well as skiing and snowboarding, snowshoeing in Hakkoda’s renowned winter wonderland is becoming more and more popular. 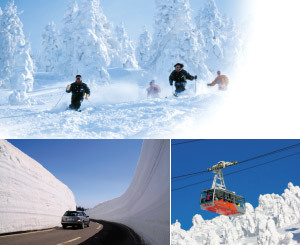 National route 103, also called the ‘Hakkoda-Towada Gold Line’, is closed during the winter months, but re-opens on April 1st every year and allows you to drive along the snow corridor, which can reach up to 9 meters in height. Hakkoda is a major hot spring area in Aomori-prefecture. This aquarium features a 15 meter-long water tunnel and an amazing dolphin show. This 76 meter-high building symbolises the initial letter of Aomori and is filled with various attractions. Aomoi is known throughout Japan as the "Apple Kingdom" and here visitors can sample apple juice.jam,pie,cider,pastries, and many other delicious products. This apple-themed roadside rest area is located in Namioka, Aomori City. Farmer’s market booths as well as the U-pick Garden are open from September to November and are very popular with visitors. Being surrounded by the Sea of Japan, the Tsugaru Strait and the Pacific Ocean, Aomori is home to various kinds of seafood. Ocean delicacies can be enjoyed in abundance throughout the seasons.